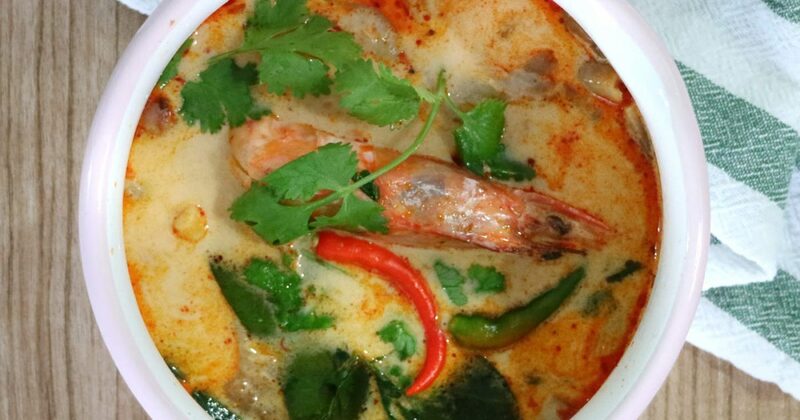 Tom Yum Goong is one of the pillars of Thai Food, probably the best known Thai dish the world around and there are of course countless variations possible. This recipe is how Faa cooks it, and we know that everyone has its own way and own preferences… If this is your first time, we tried to be a bit specific with the ingredients. Have fun and share your results and ask questions on our facebook page! Bring the broth to boil, add shallots, Galangal, lemongrass, Kafir lime leaves and mushroom stems, then move to low heat to infuse the aroma them in water, about 5-10 minutes. Remove from heat, add an equal amount of lime juice and fish sauce, adjust to taste depending on how your broth tastes like. Add the crushed bird eye chili (beware not to touch your eyes!) and the remaining of the mushrooms. 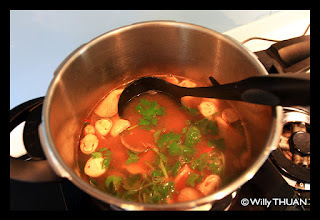 Add the prawns and bring the soup to a boil again, then add the prawns, but don’t over cook. 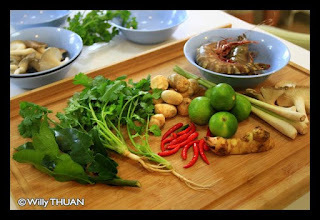 Top with fresh coriander leave and serve hot.